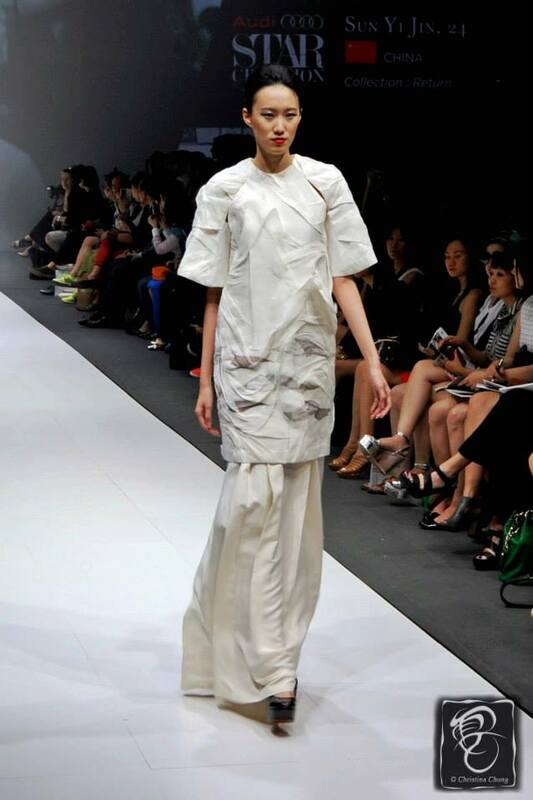 Audi Star Creation, a regional fashion design competition, identifies and nurtures emerging Asian fashion designers. First held in 2010, it’s an event of the annual Asia Fashion Exhange (AFX); the competition is open to aspiring designers between 16 and 35 years who are Asian citizens. Audi Star Creation is spearheaded by the Textile and Fashion Federation Singapore (TaFf) and sponsored by Audi Singapore and supported by fashion house, F J Benjamin. Temasek Polytechnic student from Apparel Design and Merchandising, Haziq Putra‘s “Pursuit to Freedom” took one of the competition’s three top spots. In addition, the 21-year-old also won the Audi Young Designer Award (AYDA), which is given to the winner whose creation best embodies the Audi design spirit of innovation, technology and progression. Haziq’s menwear collection featured hand-dyed batik, from which he created a digital print. He also incorporated two distinct Kelantan icons – the Wau Bulan, a giant kite , and the ikan pari, or stingray. “I thought the collection was very original and I like the fact you could see his design concept of the stingray flow right through. He was creative but not too over the top with progressive design, much like Audi. At the same time, the collection is very well made and seems to be market-ready. I can even see myself in some of his pieces!” commented Jeff Mannering, Audi Singapore’s Managing Director on Haziq’s design. 26-year-old Vietnamese, Vu Ta Linh won the judges over with “The Contour”, a womenwear collection inspired by the Vietnamese rice terraces Ruong Bac Thang in Sapa. Linh graduated from Hanoi London College of Fashion Studies in July 2012, and uses stitching, weaving and embroidery to capture the curves and waves of the Vietnamese heritage. Bagging the third and final spot was 24-year-old Sun Yi Jin from China, whose womenwear collection drew on the Chinese costumes and handicraft techniques of the 56 ethnic groups in China. Each of the three winners will get $10,000 in cash from Audi Singapore, an internship with leading fashion retailer F J Benjamin and the chance to launch a capsule collection at Audi Star Creation 2014. Many thanks to Christian from huneyzworld.blogspot.com for all the lovely photos you have seen here. This entry was posted in Events, Fashion, Shopping, Singapore and tagged AFX, apparel design and merchandising, asia, asia fashion exchange, asian, asian fashion designers, audi, audi fashion festival, audi fashion week, audi star creation, Audi Young Designer Award, china, christina chung, design, designers, emerging, ethnic, fashion, fashion design competition, fashion show, hanoi london college of fashion, haziq putra, huneyz world, huneyzworld, InspirAsian, Joel Xiang, kite, london college of fashion, men's wear, menwear, models, odile benjamin, pursuit to freedom, raoul, runway, ruong bac thang, singapore, stingray, stylist, sun yi jin, TaFf, talents, temasek polytechnic, Textile and Fashion Federation Singapore, the contour, video, vietnam, vu ta linh, wau bulan, women's wear, womenwear, yi jin, young. Bookmark the permalink.